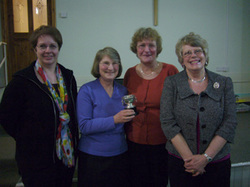 Most of you will have already heard that our quiz team, comprising Ro Cowell, Heather Leather, Jill Martin and Anne Tonge, has won the Cheshire Federation quiz. Five heats had been held in various places throughout the county in February, and the final, involving twenty-three teams, was held in Comberbach Village Hall on the evening of Friday April 1st. There were eight rounds of ten questions each, on various subjects, including Shopping, Children’s TV Programmes, Around Britain, Sport, Pot Luck and more. We were very much on our mettle, wits sharpened, ready for battle and despite the date, there is definitely no fooling around in the Federation Quiz final!! At the end of the first half, after four rounds had been completed, we knew how we lay on the “score sheet”; there were about eight teams ahead of us, but there were literally only two points difference between the leader and ourselves, with a number of teams having the same score. After a brain-enriching cup of coffee and an energising biscuit, we were ready to do battle again. Do you know which football team Ian Botham played for, or which two towns are connected by the Firth of Tay, or who were the friends of Little Weed? We did!..... On the other hand, we didn’t know what and where is Great Paul, or which is the most easterly town of Great Britain. After the sixth round, we were convinced that we were no longer in the running, so we gave up keeping our score. (The answers were given as each round was completed and handed in.) We were very surprised, thrilled and delighted to discover after much counting, and discussion amongst the recorders, that we had the highest score, 61 points, beating our hosts Comberbach by one point. We were awarded a silver cup, to be held for a year, and no doubt you will see our photograph in a forthcoming issue of Cheshire News. Many thanks to all the team for flying the flag for Kelsall once again.